Here is the orangutan (Pongo pygmaeus, aver. wgt. 170 lbs. for the male, 81 lbs. for the female), a great ape as we are. On board H.M.S. Lively, the doctor had to arbitrate a disagreement over an orangutan's head, deciding whether it was male or female. We can easily do the same. Here is the male as described by the Doctor "..lateral expansion of the cheeks, mentioned by Hunter, and the remains of that particular throat-sac, so characteristic of the male", and the female is obviously distinguishable from the male. In The Thirteen Gun Salute, the Doctor had a longer encounter with a female orangutan, named Muang. She lived on what might be called a nature preserve at a Buddhist monastery. The Doctor came to appreciate Muang's intelligence and character, and orangutans are intelligent, with a brain capacity as large as chimpanzee's. But, I believe that Mr. O'Brian was using an artist's license in this scene. I will set out my arguments, and let you decide for yourselves. 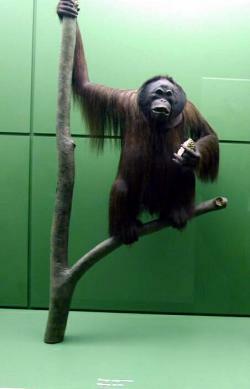 Orangutans, the most solitary of great apes, are complete vegetarians and need a large territory (approximate 5 sq. miles) to provide enough forage for an adult. Each male's territory overlaps 3 to 5 females, plus room to supply his own food. That is the explanation for the male's throat sac. Vocal calls are used to proclaim the boundaries of a males territory, and in the dense rain forest he has to make a large volume of sound to carry so far. His neck sack can expand and provide enough air to provide for his calls. The female is sexually receptive only when her child leaves her, at about 5 years of age. 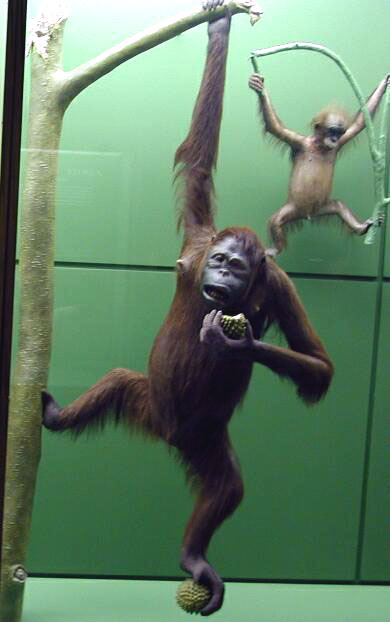 Females do not keep older children with them when they are raising another; there is no way for a bond to develop between orangutan siblings. They do not know each other. Mr. O'Brian tells us that Muang has a vocabulary of 200 words. That is the same size as the vocabulary of Koko, a gorilla that has been taught American Sign Language, at the time that he was researching for this book. Koko was born in 1972 and had learned 200 words by the time the first popular books about her were published. By 1987, she knew 500 words, and at the present she knows 2000. Koko has been able to learn that much, because her keeper and trainers work with her for up to 16 hours a day every day. Gorillas are much more social than orangutans; they live in large family groups of 10 to 20 individuals, with constant companionship. I doubt that an orangutan could comfortably tolerate that amount of interaction. Muang is also shown to walk on two (or four) feet for great distances. Orangutans, like gibbons, have evolved especially for life in the trees. 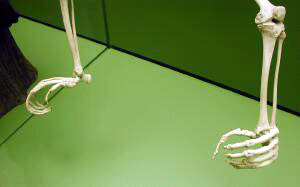 The actual bones of their hands and feet are curved to make it easier for them hold onto branches. I doubt that they could travel that far their feet, and even though they are dexterous, the curvature of their hand bones would make it harder for them to manipulate tools as well as the chimpanzees can with less specialized finger bones.